U.S. Secretary of State becomes the highest-ranking American official to meet President Abdel Fattah al-Sisi since he came to power. 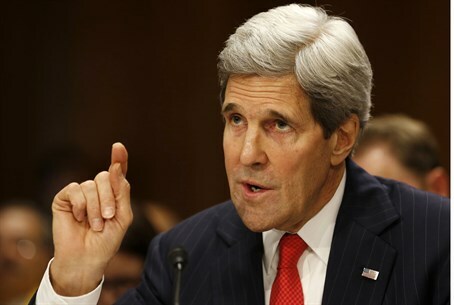 U.S. Secretary of State John Kerry on Sunday visited Cairo, becoming the highest-ranking American official to meet President Abdel Fattah al-Sisi since he came to power earlier this month. According to AFP, Kerry pressed Egypt's leaders to allow greater political freedoms, as Washington unlocked some $572 million in military aid for Cairo and hurried the dispatch of 10 Apache helicopters. Kerry told a press conference he had emphasized in his "candid" talks with Sisi that the new government must uphold "the universal rights and freedoms of all Egyptians." "We also discussed the essential role of a vibrant civil society, free press, rule of law and due process in a democracy," said Kerry, according to AFP. His call for a free press in Egypt comes as a court on Monday is due to deliver its ruling in the trial of three Al-Jazeera journalists and 17 other co-defendants, accused of aiding the blacklisted Muslim Brotherhood of ousted president Mohammed Morsi. Their trial, in which the three journalists are accused of "spreading false news" and links to the Brotherhood, has sparked an international outcry as rights activists fear Egypt could return to autocracy worse than under Mubarak. "Obviously this is a critical moment of transition in Egypt," Kerry said earlier as he met new Foreign Minister Sameh Shoukri. But he stressed "the United States remains deeply committed to seeing Egypt succeed." "There is no question that Egyptian society is stronger when all of its citizens have a say and a stake in its success,” said Kerry. Since Egypt's first freely elected leader Morsi was toppled by Sisi in July 2013, a government crackdown on his supporters has left more than 1,400 people dead in street clashes and at least 15,000 jailed. Meanwhile, American officials revealed that $572 million in aid, which had been frozen since October, was released to Egypt about 10 days ago after a green light from Congress. It will mainly go to pay existing defense contracts. Washington said in April it planned to resume some of the annual $1.5 billion in mostly military aid to Cairo, including 10 Apache helicopter gunships for counterterrorism efforts in the Sinai Peninsula. "The Apaches will come and they will come very, very soon," Kerry said minutes before he left Cairo and flew to Amman for further consultations on Iraq.